The customer relationship management software provider skidded along with fellow cloud software providers last month. Can salesforce withstand the souring regard investors seem to hold for this group of growth companies when it reports earnings next week? The sales rep has "made quota" in this depiction of the company's mobile app. Image : salesforce.com. What: Stock in salesforce.com (NYSE:CRM) fell 13.2% in January, according to data from S&P Global Market Intelligence . So what: The company's January weakness followed a year in which the "CRM" ticker gained 32%. Some of the selling can be attributed to the market's overall January malaise: the NASDAQ Composite Index drooped by 8% in January alone. But more pertinent to salesforce's fortunes is the sudden skepticism focused on cloud-based software companies. Due to double-digit revenue growth rates, companies in this sector of the software industry have enjoyed relatively high valuation multiples versus more traditional providers until very recently. Perhaps due to overall vulnerability in the stock market, these multiples are undergoing close scrutiny. Perhaps this chart presaged the current month. Tableau and Qlik, both in the business of providing data analytics, dismayed the markets with their respective earnings releases over the last two weeks. Tableau's management had offered what it termed a "glimpse" into its 2016 revenue outlook during the company's Q3 2015 earnings call in November of last year. At the time, executives projected full year 2016 revenue in a range of $845 million-$865 million. However, in its Q4 2015 earnings release on February 4th, Tableau reduced this range to $830 million-$850 million. As management pointed out, hitting the high end of this revised band would still equate to 30% year-over-year revenue growth. But conditions have changed in the broader market since the end of 2015, and the stock faced fierce and unrelenting selling after earnings were filed, skidding nearly 51%. Similarly, Qlik offered a rather lukewarm revenue outlook for 2016 in its Q4 2015 earnings report on February 11th, indicating full year revenue growth of 13%-15%. Again, there seems to be little tolerance in the current market environment for steeply valued companies which face even nominal growth challenges: Qlik's shares have plummeted 41% thus far in February. Salesforce and Splunk shareholders can fasten their seatbelts, as these companies will release fourth quarter and full year 2015 earnings on the 24th and 25th of February, respectively. Now what: It's interesting to note that in the sell-off in the cloud sector sparked by the likes of Tableau and Qlik, and exacerbated by cloud-based professional network LinkedIn Corp's (NYSE:LNKD.DL) roughly 50% stock pummeling last week, Splunk has lost 41.3% of its value, even though it has yet to report earnings. 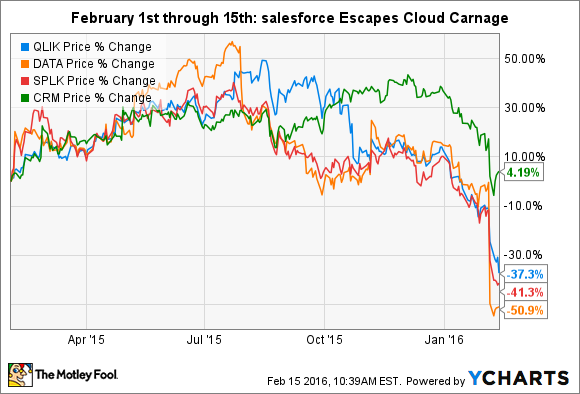 Salesforce, however, has managed to actually climb so far this month. Back in November, salesforce raised full year 2015 guidance, upping its revenue forecast of between $6.60 billion-$6.63 billion, to a range of $6.64-$6.65 billion. Management also communicated improved full year earnings per share guidance, from a loss range of ($0.15) to ($0.17), to a smaller deficit of ($0.11) to ($0.12). With acceptable 2015 results seemingly in hand, what will happen if salesforce also depicts a slower year ahead -- will investors dole out the same magnitude of punishment that Tableau and Qlik received? It's a difficult question to obtain clarity on. Unlike younger companies in this sector, salesforce has built investor confidence over a period of years, as it's gradually scaled into one of the world's larger software companies, with trailing twelve month revenue of $6.3 billion. But the same might have been said about LinkedIn. With $3.0 billion in trailing twelve month revenue, and a multi-year rise to prominence, LinkedIn, like salesforce, has benefited from the patience and conviction of investors. This didn't stop LinkedIn's stock price from getting sliced in half during the first two weeks of February, on a warning of weakening top-line expansion. Adding to uncertainty is salesforce's rich valuation relative to fellow cloud corporations, some of which, admittedly, have been drastically revalued by the market this month. Currently, salesforce trades at a price to sales, or PS, multiple of 4.2 times forward one-year sales. In comparison, Qlik, Tableau, LinkedIn, and Splunk, trade at PS ratios of 1.9, 2.4, 2.6, and 3.8, respectively. In theory, salesforce's earnings report shouldn't produce an earth-shattering movement in the company's stock price. Management has guided revenue toward a very narrow range; this specificity indicates a high confidence level in fourth quarter numbers. And near-term results should be stable. This is because the company continues to garner generous portions of its revenue through advanced bookings, leading to ratable income from quarter to quarter. Salesforce also remains proactive in creating revenue opportunities through tuck-in acquisitions. The latest example is its December 2015 agreement to purchase Steelbrick Inc, a "quote to cash" sales cycle software provider which operates natively on the salesforce.com platform, for $360 million. Even accounting for the factors above, given the middling revenue outlooks provided by its peers so far this earnings season, salesforce is certain to see its shareholders zero in on the full year 2016 revenue guidance when it unveils earnings next week. A positive projection may well support the modest climb the "CRM" symbol has produced in February. 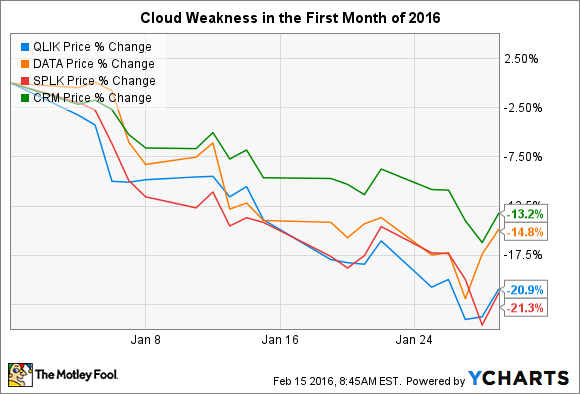 If the company cautions on its growth prospects, however, we shouldn't be surprised to see the market work up at least some of the wrath it's visited on fellow cloud companies this month.